In the past 10 years computer architecture research has moved to more heterogeneity and less adherence to conventional abstractions. Scientists and engineers hold an unshakable belief that computing holds keys to unlocking humanity's Grand Challenges. Acting on that belief they have looked deeper into computer architecture to find specialized support for their applications. Likewise, computer architects have looked deeper into circuits and devices in search of untapped performance and efficiency. The lines between computer architecture layers---applications, algorithms, architectures, microarchitectures, circuits and devices---have blurred. Against this backdrop, a menagerie of computer architectures are on the horizon, ones that forgo basic assumptions about computer hardware, and require new thinking of how such hardware supports problems and algorithms. 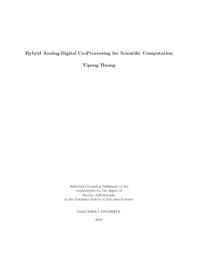 This thesis is about revisiting hybrid analog-digital computing in support of diverse modern workloads. Hybrid computing had extensive applications in early computing history, and has been revisited for small-scale applications in embedded systems. But architectural support for using hybrid computing in modern workloads, at scale and with high accuracy solutions, has been lacking. I demonstrate solving a variety of scientific computing problems, including stochastic ODEs, partial differential equations, linear algebra, and nonlinear systems of equations, as case studies in hybrid computing. I solve these problems on a system of multiple prototype analog accelerator chips built by a team at Columbia University. On that team I made contributions toward programming the chips, building the digital interface, and validating the chips' functionality. The analog accelerator chip is intended for use in conjunction with a conventional digital host computer. The appeal and motivation for using an analog accelerator is efficiency and performance, but it comes with limitations in accuracy and problem sizes that we have to work around. and differential equations are naturally solvable in the analog accelerator chip. A hybrid analog-digital computer architecture can focus on solving linear and nonlinear algebra problems to support many workloads. The second problem is how to get accurate solutions using hybrid analog-digital computing. The reason that the analog computation model gives less accurate solutions is it gives up representing numbers as digital binary numbers, and instead uses the full range of analog voltage and current to represent real numbers. Prior work has established that encoding data in analog signals gives an energy efficiency advantage as long as the analog data precision is limited. While the analog accelerator alone may be useful for energy-constrained applications where inputs and outputs are imprecise, we are more interested in using analog in conjunction with digital for precise solutions. This thesis gives novel insight that the trick to do so is to solve nonlinear problems where low-precision guesses are useful for conventional digital algorithms. The third problem is how to solve large problems using hybrid analog-digital computing. The reason the analog computation model can't handle large problems is it gives up step-by-step discrete-time operation, instead allowing variables to evolve smoothly in continuous time. To make that happen the analog accelerator works by chaining hardware for mathematical operations end-to-end. During computation analog data flows through the hardware with no overheads in control logic and memory accesses. The downside is then the needed hardware size grows alongside problem sizes. While scientific computing researchers have for a long time split large problems into smaller subproblems to fit in digital computer constraints, this thesis is a first attempt to consider these divide-and-conquer algorithms as an essential tool in using the analog model of computation. As we enter the post-Moore’s law era of computing, unconventional architectures will offer specialized models of computation that uniquely support specific problem types. Two prominent examples are deep neural networks and quantum computers. Recent trends in computer science research show these unconventional architectures will soon have broad adoption. In this thesis I show another specialized, unconventional architecture is to use analog accelerators to solve problems in scientific computing. Computer architecture researchers will discover other important models of computation in the future. This thesis is an example of the discovery process, implementation, and evaluation of how an unconventional architecture supports specialized workloads.